This site is now&nbsp; available in book form, Click here. The RLDS Council of Twelve, 1901. Image provided courtesy Community of Christ Library-Archives, used with permission. I would like to encourage visitors not to copy the above image and refer them to the Archives at rromig@cofchrist.org. 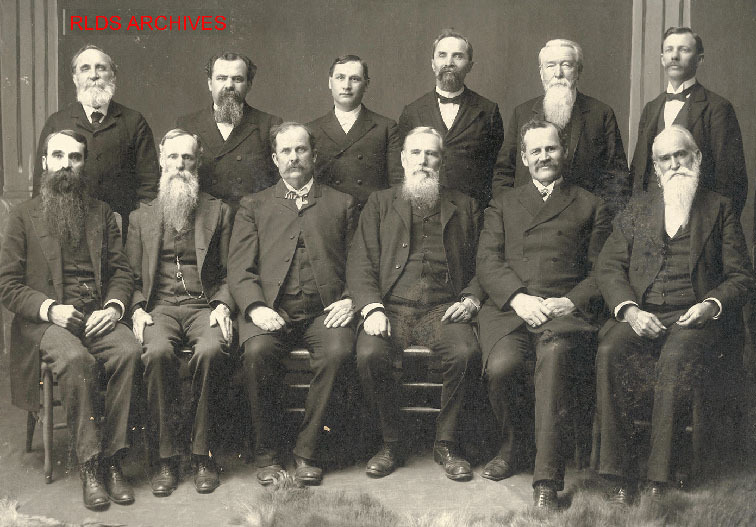 &nbsp; Who was Who in RLDS History is a website dedicated to the many people who contributed to the history of the Reorganized Church of Jesus Christ of Latter Day Saints. Here you will find biographical and bibliographical information about the ministry, politicians, authors, composers, and interesting characters who were a part of this movement. &nbsp; This site has no official association with the Community of Christ/Reorganized Church of Jesus Christ of Latter Day Saint.&nbsp; I have included links to sites from various religious traditions. This&nbsp; includes a number of different restoration groups as well as some that are dedicated to convincing people to leave the restoration movement. Inclusion of these sites is only to provide access to biographical information and should neither been seen as approval or disapproval of any views or doctrines promulgated on them. Click here to participate in a discussion forum on RLDS History and Biography or to post comments about this website. The index is divided into five pages (each approximately 8x11 for easy printing) So if you wanted to find information on WW Blair, for instance you would click on (A-D) to the right.. From this resulting index click on Blair's name to get to an individual page dedicated to him. &nbsp; Not $ - this website is on Geocities and cost me nothing but my time and energy. But some of you have worked long and hard on family histories or a term paper concerning a person of note within the Restoration movement. Consider posting it on this page or perhaps a link to it from your own page. Maybe you have access to an old publication and would like to scan it and send it to me. Perhaps a digitized photo of your uncle who wrote a hymn or was the 1st RLDS missionary to Mississippi. Your contributions are welcomed.